The story of rising labor costs in China is one we've been tracking the past few years, but not getting enough attention in the media. [Feb 27, 2008: China Raising Minimum Wage] [Feb 3, 2008: China's Inflation Hits American Price Tags] [Jan 27, 2011: China Hikes Minimum Wage Again] I expect in a decade a lot of people to be "surprised" by this development - which already is years in the making. Long story short, at minimum the pace of price improvements for American consumers will slow... and quite likely the golden era of uber cheap will begin to see a reversal as the Chinese laborer demands entry into a reasonable form of middle class. [Jun 2, 2010: Cheap Labor Fighting Back in China] [Apr 6, 2011: Rising Costs, Higher Wages Drive Low Cost Manufacturing Out of Southern China] Just another pressure coming down the pike for the American middle (and former middle) class. 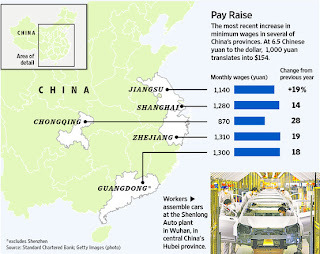 Wages are rising in China, heralding the possible end of an era of cheap goods. For the past 30 years, customers would ask William Fung, the managing director of one of the world's biggest manufacturing-outsourcing companies, to make his products—whether T-shirts, jeans or dishes—cheaper. Thanks to China's seemingly limitless labor force, he usually could. Now, the head of Li & Fung Ltd. says the times are changing. Wages for the tens of thousands of workers his Hong Kong-based firm indirectly employs are surging: He predicts overall, China's wages will increase 80% over the next five years. That means prices for Li & Fung's goods will have to rise, too. "What we will have for the next 30 years is inflation," Mr. Fung said. "A lot of Western managers have never coped with inflation." "Inflation has been damped pretty dramatically in the U.S. because it exported work to China and other places at 20% or 30% of the cost," said Hal Sirkin, a consultant at Boston Consulting Group. The years of dramatic reductions in costs are over, the firm says. Li & Fung traces the start of rising wages to the "Foxconn Effect." Foxconn is the trade name of Hon Hai Precision Industry Co., maker of iPads for Apple Inc., and computers for Hewlett-Packard Co., among others. After a string of worker suicides last year at one of its China plants spurred Foxconn to defend its treatment of employees, the company raised wages 30% or more in a bid to improve worker conditions. That raise came as workers at other factories, including staff at a Honda Motor Co. parts plant, went on strike for higher pay. Since then, the Chinese government has supported higher wages in part to address labor unrest, but also as way to boost domestic consumption and reduce reliance on exports to expand the economy. The rising wages affect both foreign and domestic companies. Other factors besides rising wages are pushing up the price of goods. Chinese workers, for one, are starting to buy more with their higher salaries. That's contributing to higher prices for commodities such as cotton and oil, which are already climbing in part because of a weaker dollar. Rising living standards in developing economies like China will keep prices of natural resources high as demand outpaces supply. China's move to let the yuan slowly appreciate in value—something eagerly sought by its Western trading partners—adds fuel to the fire. A stronger yuan makes it cheaper for China to import the raw materials it needs, such as iron and soybeans, helping tame domestic inflation. But it makes its exported goods more expensive for other countries to buy. "This idea that we have moved from an era of easy deflationary environment to one of inflation is correct," said Jeffrey Sachs, economist and director of the Earth Institute at Columbia University. During China's 30 years of economic growth, hundreds of millions of factory and urban jobs soaked up surplus rural farm labor. In the past three or four years, he says, that extra labor has been exhausted. Many analysts predict that China's vast labor force will begin declining in the next year or two, the result of family-planning policies. Others say there's already a shortage of the most active members of the factory floor, workers aged 15 to 34. That group has been steadily declining since 2007, according to Jun Ma, Deutsche Bank's chief economist for Greater China. A shrinking work force will need higher salaries to support an expanding population of elderly. There's some debate about the impact and extent of these wage increases on foreign markets. The pace of inflation for U.S. imports is running around 7% this year,..... with real wages stagnant for decades, many Americans .....have grown dependent on cheap imported goods. 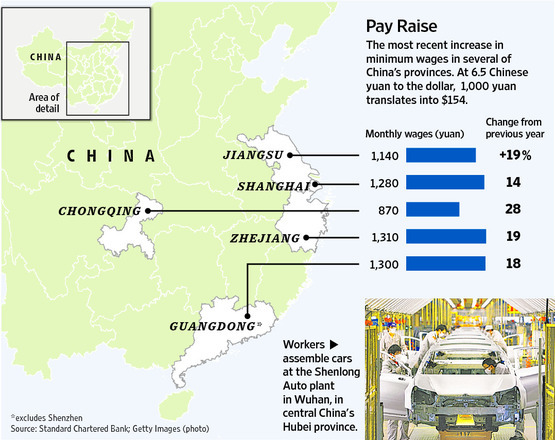 China still has cheap labor in its interior, away from its developed coastal cities, and productivity gains could mitigate higher wage costs. For example, Foxconn announced it was expanding operations to inland areas near Chengdu, Wuhan, and Zhengzhou, away from its coastal base.Li & Fung is encouraging its suppliers to invest more in their factories to increase worker productivity and raise the quality of goods. There are limits to what those measures will achieve. Some analysts say that the wage increases will sharply outpace any productivity gains. Moving inland means lower wages, but higher transportation costs on China's crowded highways and railroads. Furthermore, locating the factories in China's hinterland puts them in a better position to service China's growing domestic consumer market instead of exporting to consumers in the U.S. and elsewhere. Faced with rising wages within China, some companies are shifting resources elsewhere to keep costs down. Yue Yuen Industrial (Holdings) Ltd., the world's biggest shoe maker, has started moving manufacturing of low-cost shoes from China to countries such as Bangladesh and Cambodia. But the wage gap between China and other developing countries will shrink, said Mr. Fung, echoing views shared by Boston Consulting Group, because "China was the thing that kept the price low," he says. "China was the benchmark. With the China price rising, everyone else wants to raise prices." As factories relocate to other countries, local wages will rise faster than they did in China because the potential pools of surplus labor are smaller. In addition, because no other country can replicate the massive scale of China, logistics will become a larger part of costs as companies are forced to slice up their manufacturing over several countries, analysts say. "Things will be more expensive and people will buy less," Mr. Fung warns. That means that the West will have to adopt new consumption trends.